My son Dinakar is suffering from Thalassemia disease since he is 5 months old. Every 25 days, he needs to undergo blood transfusion. He has been receiving treatment in Masonic Medical Center for Children in Coimbatore, which is about 83km from my village. Some information about Thalassemia: Thalassemia is an inherited blood disorder in which the body makes an abnormal form of hemoglobin. Hemoglobin is the protein molecule in red blood cells that carries oxygen. The disorder results in excessive destruction of red blood cells, which leads to anemia. 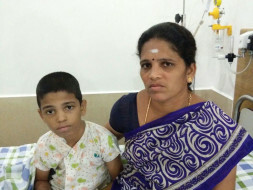 Now, my son has reached a stage, where he must undergo Bone Marrow Transplantation (BMT). There are only 2 hospitals in Tamilnadu that have good doctors and equipments for this treatment. My son is undergoing BMT in Apollo Hospital in Chennai since 24th November 2016. 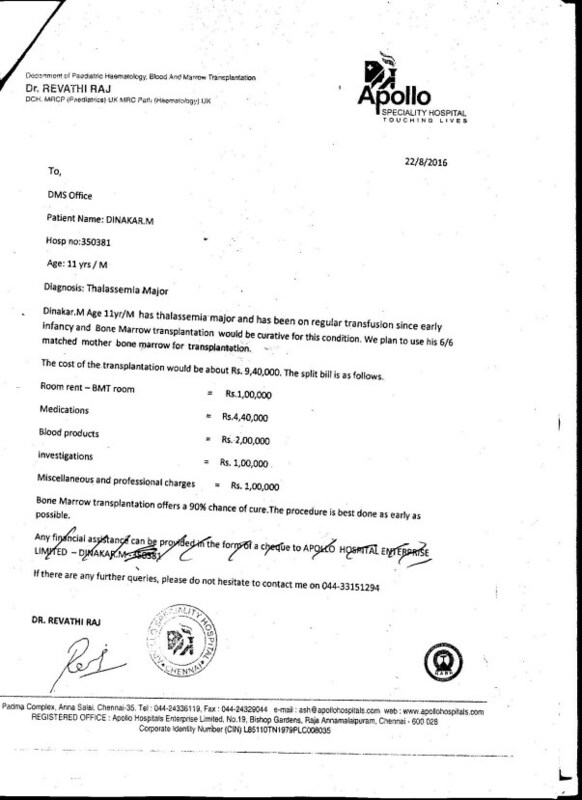 The estimated cost given by the hospital for the Operation, including bed charges and medication, is Rs. 10,00,000. I would receive Rs. 9,40,000 for the treatment under Tamilnadu Government Insurance scheme. But, after operation, Doctor has advised 3 months of post care treatment for which I must stay in Chennai. I need to rent a house, medical charges and food for 3 months is estimated to cost Rs. 2,50,000. I've no source of income during this period. I’m working in a textile mill as daily wager. My husband passed away 2 years ago. I have a daughter studying 12th grade. I have no affordability to meet this expense. As a family, we are going through a lot of struggle to overcome this unfortunate disease and lack of income and wealth is adding to our burden. So, I’m posting this through one of the volunteers to seek your support and help. Please help me with anything that you could offer, to save my son. Operation date: 24th November 2016 at Apollo Hospital in Chennai. Door No. 66, Singiripalayam Pirivu, Akkarai Kodiveri post, Gobichettipalayam, 638454.